Note: these snails are currently illegal to keep in the united states. 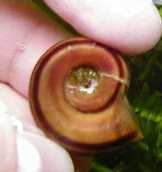 Wild Type – light yellow to brown shell base, dark brown spiral stripes thicker to one side, light brown-speckled body. Body color varies. 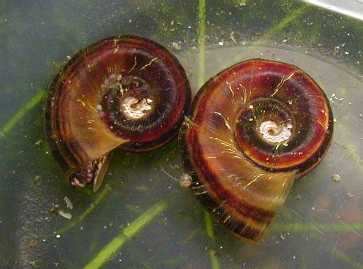 Double-Light-Sided Wild – light yellow to brown shell base, dark brown spiral stripes thicker to one side, but both sides of the shell are light (normal wild type has a “dark side” and a “light side”). Body color varies. 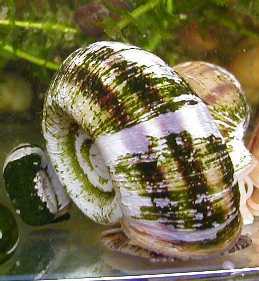 Variegated Wild – light yellow to brown shell base, dark brown spiral stripes thicker to one side, but both sides of the shell are light (normal wild type has a “dark side” and a “light side”). The stripes towards the left side of the shell show an abnomal pigmentation pattern in which the direction of the stripes changes every few milimeters and is always at an angle to the rest of the stripes towards the center and right side of the shell. Body color varies. Variegated shells can also occur with non-double light wilds, but the zig-zag stripes are nearly impossible to see. Golden – light yellow shell base with either darker yellow stripes or no stripes at all. Body color varies but is usually black blotch or black. (Unnamed) – white shell base, brown stripes, any color body. Variegated Wild – wild to double-light wild shell with a different patern of striping on the left side of the shell: the stripes on that side alone are zig-zagged to produce a regular abnormal pattern of pigmentation. This variety has yet to be refined and needs to be crossed to doubl-light to produce more distinctive individuals. The two primary Marisa colors: Golden (top) and Wild (bottom, shown from the “dark” side.). A Wild Type Marisa, shown from the “light” side. Some of these type will have red-brown stripes (shown here), others will have stripes closer to black, and a yellower shell base. Unfortunately both individuals’ shells are slightly obscured with encrusting algae. Image contributed by Nannasmom. A double-light wild (left) and a normal wild (right). Both are shown from the normally dark brown side; note that the double-light has gold where the brown would usually be. A double-light wild (left) and a normal wild (right). Both are shown from the normally light side. Two double-light wilds (poor lighting, but compare to the normal wild in the two pictures above). From left to right: a red-bodied wild, a double-light wild, and a variegated wild.